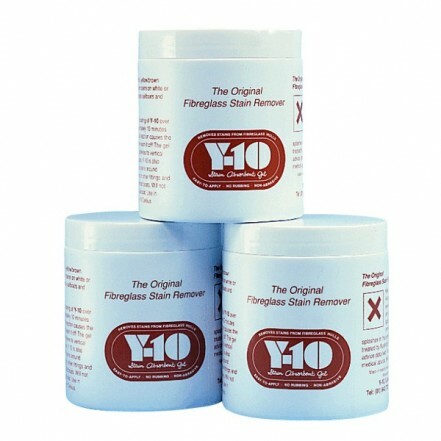 Y-10 Stain Abssorbent Gel removes stains from fiberglass hulls. The original fiberglass stain remover. Easy to apply. Smooth blue gel specifically formulated to remove stubborn, unsightly stains. Harmless to fiberglass gel coats. Effective against rust stains around engine exhaust ports or other fittings. Not a general cleanser and will not remove discolorations caused by oxidation, paint, tar or grease. Rustproof and shatterproof jar. 340g jar.